Built in 1907, by the Wallace Towboat Company of Tacoma, Washington as the Vigilant for the Wallace Towboat Company of Tacoma, Washington. 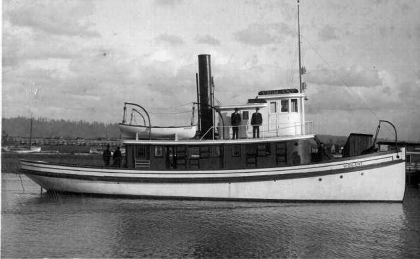 In 1920, the tug was acquired by the Cascade Tugboat Company of Anacortes, Washington. Where she retained her name. In 1933, the tug was acquired by Foss Launch and Tug Company of Tacoma, Washington. Where she was renamed as the Anna Foss. In 1968, she was acquired by her Chief Engineer Everett Atkinson of Tacoma, Washington. Where the tug was renamed as the Vigilant I. In 1969, the tug sank when her bilge pump failed. She is 40(ft) down in Colvos Passage, located just offshore of Everett Atkinson's Vashon Island home. Originally powered by a single, 75 horsepower steam engine. In 1926, the tug was re powered with a single, two cycle, Worthington diesel engine. For a rated 200 horsepower. Ship Builder: Wallace Towboat Co.
Wallace Towboat Co., Cascade Tugboat Co., Foss Launch and Tug Co.